Do we lay floor tiles under the bath? We are about to order electric UFH mats for bathrooms. We need some insulation boards to go under the electric mat. Do we put the insulation boards and/ or the tiles under the bath? (a back to wall bath, no panel - it’s all one unit so sort of free standing). The basin and toilet are wall hung so the boards will go under those. Then you latex over the whole lot to get a flat surface for tiling - and tile under bath ensuring you have made allowance for drainage - the flex connector we got with our freestanding bath was not sufficient so plumber had to rip a big hole in the newly tiled and tanked floor to make space for a proper u bend. Thankfully we dodged hitting the UFH mat - heart was in mouth that day. Our tiler did the whole thing - I have the alarm box for the mats that warns you if they get damaged during laying, if you want to borrow. You need to take multimeter measurements when they're rolled up, unrolled and installed and record these for the warranty. Used 150W Warmstar mats off eBay - work a treat. How are you doing the shower tray/trap? If the tray is going on the floor (no plinth) then use a top access trap. We omitted the insulation under the tray and built a platform from marine ply and treated timber roughly the same height. That gave space for the pipework under the tray. Our tray was very heavy so we made a template and used it to get the waste pipe and base of the trap in the right place (clearance hole in the marine ply). Once happy the trap was in the right place we glued the tray down over it. Then seal and screw the top part of the trap through the tray into the bottom part. 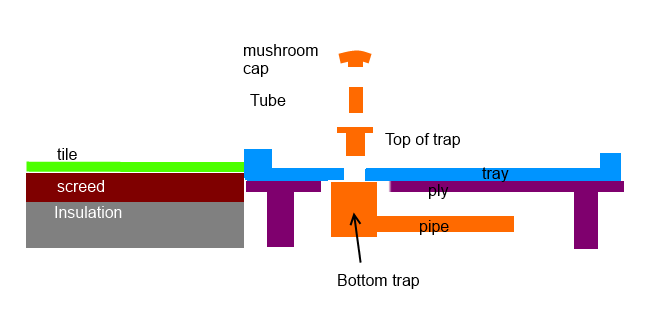 Then fit the tube that forms the water seal in the trap and mushroom cap. How﻿ are you doing the shower tra﻿y/trap? First floor bathrooms. On Egger board flooring at present. Pipework in the ground floor ceiling void. So tray can go directly onto floor provided tile and insulation board depth isn’t greater than the tray I guess. That can be of benefit, as the layers outside of the tray area bring you close to a flush floor / level entry into the shower. Do we put the insulation boards and/ or the tiles under the bath﻿﻿﻿?﻿ ﻿(a back to wall bath, no panel - it’s all one unit so sort of free standing). What you have to do is watch the point loading of the bath feet. For me I'd run the insulation board within about 100mm of the feet and then backfill the remaining void with self leveller / tile adhesive so where all 4 / 5 bath feet hit the deck there is solid tile > adhesive > deck underneath. By complete fluke, we ended up with a 25mm shower tray on the OSB deck being completely flush with the adhesive / backer board / UFH mat / latex / tile adhesive / tile. When we fitted the shower glass, it went on a bead of clear Sikaflex on the shower tray edge - we used a few 2mm spaces to get some clearance. Once the Sikaflex had set, spacers were removed and the gaps plugged up with more sealant. Looks smart. N.B. Nick has a bulletproof guide to tanking a shower area and fitting a shower tray - we followed it to the letter (even though plumber was not keen) and have never had any issues. Check the bath waste fittings now before tiling as you can plan a neater solution than the one we had to bodge, Nick also had a method for building a little wall around the opening for waste to prevent any water ever making its way down there (we had to use loads of SikaFlex). Another note - after tiling, the engineered wood floor in the hall outside the bathroom would have come up a bit short, so the floor guy built up a subtle ramp of latex to bring it all flush - you'd never know from looking at it. Stainless steel threshold to finish it off. As in no boards under the shower tray - the ufh mat alarm box gives you peace of mind during install. Once tiles are on you're good. Do take pictures & measurements of where the mat is before tiling, just for peace of mind. You can also put a plug top on the mat to test it and take a pic with a thermal camera - can't recall who said they used to do that to prove the install was successful!. Yes should be fine if it's not a wet room. If tiling the shower area and any of it is studwork wall I recommend using a 12mm waterproof cement board like Hardibacker board. Not only does it stand up to any water much better than plasterboard but it takes fastenings quite well. So if you want a soap dish, or hook for a shower head you don't have to worry about screwing into a stud, it can just about fix anything anywhere (although perhaps not something like a heavy cabinet). Tank the walls behind the tiles if its an area that's going to get consistently wet (like a shower) and follow @Nickfromwales instructions on how to lay the tray. We used a cheap paint on system with a corner profile - first coat horizontal and second coat vertical. Basically you want any water that may get behind the tiles to run down and find a way back into the tray rather than into the floor. Provided your screen sits on the tray and is sealed properly, there should not be lots of water hitting the floor tiles so you don;t need to tank the floor.